Phong Nha - Ke Bang: Where is honeymoon in Viet Nam? 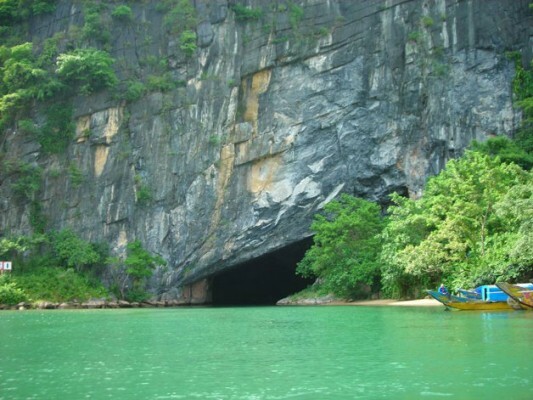 Phong Nha Tours » Phong Nha Ke Bang Travel News » Where is honeymoon in Viet Nam? In our S- shaped country, few places have advantages on tourism as Quang Binh. Favored variations of topographies from sea, rivers, and mountains to gigantic caves system, in addition, Quang Binh is cultural land of high value cultural and historical vestiges. All these build a peculiarly feature for Quang Binh tourism. Going to Quang Binh first, tourists can be completely infatuated with green color of grass, tree and rolling mountains hidden by wonderful mist in each morning. In recent time, Quang Binh develops honeymoon tourism services for couples thanks to these things. Newlyweds not only have time to discover the Nature, enjoy sweet moment in honeymoon but also record beautiful memories by wedding photographs or life ones in the start of a family. You can’t talk about Quang Binh if you don’t mention to Phong Nha – Ke Bang landscape, blue Nhat Le Sea, peaceful Le Thuy countryside in sunset and home’s flavor dishes. Climate in Phong Nha – Ke Bang is very fresh, cool thorough years with average temperature about 20 – 24o C. It is considered as one of the two largest limestone regions in the world, with 200,000 hectare in area (including 85,754 hectare in core zone and 195,400 hectare in buffer zone). Typical features of this national park are millions- year-old karst tectonics with more than 300 caves and underground river system. Exiting rare hundreds of flora and fauna, including species in the world’s and Vietnam’s Red Book is the main inspiration to tourists and scientists for discovering this land. Phong Nha – Ke Bang is one of the oldest and largest limestone zones in the national park world. Tourists can not only contemplate pristine and gorgeous beauty of the huge limestone mountain, but also know about many caves as Phong Nha Cave, Tien Son Cave, Vom Cave, and so on. Located at Ke Bang limestone mountain in Son Trach commune, Bo Trach district, Quang Binh provine and far Dong Hoi about 50 kilometers toward the Northwest, Phong Nha Cave called “ the most beautiful cave in Vietnam” is shrouded by tropical forests. From Son River, it takes about 30 minutes to take tourists to Phong Nha Cave. In front of the door, seductive river and mountain sights and gorgeous landscapes with endless of interesting images appear to stir people’ imaginary. Cave’s door is trapezium with 20-25 meters of width, 10 meters of height. Boating through cave’s door, sultry feeling of summer in the Central Region, which is effected by Laos wind immediately disappears, the deeper they go, the paler the light is then they completely disappear, a marvelous world appear in front of tourists’ eyes. Phong Nha is known for unique stocks of rock named after its natural shape as “ Su Tu” ( Lion), “ Ky Lan” ( Unicorn) “ Cung Dinh” ( Royal palace), and so on. Finishing a 19-kilometter underground water of Truong Son range, the river appears in cave’s door with blue in dry seasons and red in rain season. Tourists can find out tectonics of mandolin and stalactite in several out of 14 rooms in cave. Tien Son cave lasts 800 meters, and also the twin of Phong Nha Cave, a masterppeice of stalactite. After visiting Phong Nha water cave, commonly, tourists will go to Tien Son dry cave. It is said that if Phong Nha is a palace in water, Tien Son is described as palace in the heaven. The name “dry cave” come from the reason that it is not connect to Phong Nha, it is located at 200 meter height comparing with the ceiling of Phong Nha cave. Tricking about Quang Binh isn’t only gorgeous caves; this is romantic and gentle white sand beaches. Nhat Le beach is known for immense sky and sea, windy sky, blue water. Nhat Le beach is clean as a new mattress, sand is shining in morning sunny, tourists can bike bicycle and play soccer comfortably. Although, now, Quang Binh hasn’t yet been the first choice when couples thinks about their honeymoon, certainly, in next time, with plan and development of tourism, Quang Binh is an ideal destination forhoneymoon tour in Vietnam like Nha Trang, and sapa vietnam. Share article Where is honeymoon in Viet Nam?